Shimadzu, one of the world leaders in analytical instrumentation, has released a new and unique fully automated sample preparation module (RUO) connected online for LCMS to the four major clinical research markets in Europe, i.e. Germany, France, Italy and Spain. The CLAM-2000 (Clinical Laboratory Automated sample preparation Module) automates the pretreatment of blood or other biological samples before LCMS analysis. It is designed for customers handling blood samples in pharmaceutical departments, medical departments or biological analysis laboratories dealing with issues of variability in analytical results or infection risk. By simply placing blood collection tubes in the system, the CLAM-2000 performs all processes through to LCMS analysis automatically. Unlike dispensing systems based on batch processing 96-well plates, the CLAM-2000 is completely automatic from pretreatment to analysis and processes individual samples successively in parallel. Consequently, it results in uniform pretreatment times between samples without slowing processing speed, while improving data reproducibility and accuracy. Consequently, the new CLAM-2000 is the first system in the world able to perform all steps fully automated from pretreatment of the sample to LCMS analysis, requiring only the simple task of placing the blood or biological fluid collection tubes, reagents, internal standards and specialized pretreatment vials in the system. It also features excellent management functions tproviding a dramatically improved workflow with better safety for clinical research and higher reproducibility. It is compatible with the LCMS TQ systems LCMS-8040, LCMS-8050 and LCMS-8060, giving a large choice to adapt to sensitivity needs. 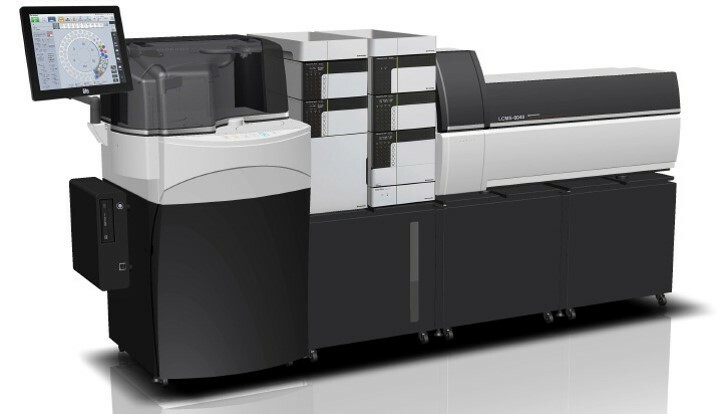 Shimadzu has released the world’s first system for fully automated sample preparation connected online for LCMS. The CLAM-2000 (Clinical Laboratory Automated sample preparation Module) automates the pretreatment of blood or other biological samples before LCMS analysis. It is designed for customers handling blood samples in pharmaceutical departments, medical departments or biological analysis laboratories dealing with issues of variability in analytical results or infection risk. For Research Use Only. Not for use in diagnostic procedures.Not available in the USA, Canada and China. This page may contain references to products that are not available in your country. Please contact us to check the availability of these products in your country.